Images of Bandai’s upcoming series of In Action!! Off Shoot figures based on mechs from the hit series Code Geass: Lelouch of the Rebellion have shown up in Amiami yesterday. The Lancelot, Sutherland and Sutherland (Purist Faction ver.) figures will be released March 2008. They look pretty nice, but recently some of Bandai’s figure releases have quality issues that make them look disappointingly inferior to their pre-release images *cough* MSiA Exia *cough*. I think it’s best to check them personally first once they’re on the shelves to decide if they’re worth getting. More pics after the jump. 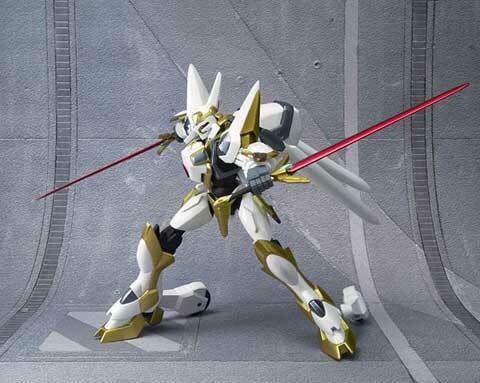 This entry was posted in Figure News and tagged Code Geass, MSiA by Snacks. Bookmark the permalink. Code Geass didn’t really reel me in with the mecha designs, so I’ll pass. Personally I’ve never seen the show, but I saw a model for this at my local hobby shop, and it looks pretty interesting to build. At least, it BETTER be for $47.